Virtual surround sound gaming headphones are nothing new. If you’ve tried on a pair of Turtle Beach or Razer headphones in the last decade, you’ve probably heard it. But the problem with these headphones is that the sound isn’t dynamic – no matter how you move your head, you’re going to hear the same exact effects at the same exact volume. The first gaming headphone from Audeze, a name you might recognize for its work in high-end audiophile headphones, is going to change that. 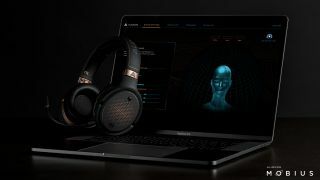 The company recently unveiled its first gaming headphone, the Audeze Mobius, that uses head tracking to position audio appropriately. Once calibrated, the headphones will amplify the sound in the right earcup when you turn your head left, and vice versa when you turn your head the other way. The reasoning behind this, says Audeze CEO Sankar Thiagasamudram, is to help bridge the gap between the sounds generated in-game and how sounds naturally enter the ears. The result, he believes, is a more natural, electrifying experience that will bring gamers closer than ever to the action on the monitor. Of course, gamers aren’t only interested in using their PCs to play games – most of them are audiophiles or TV streamers, too. That’s where the Mobius’ secret weapon – a pair of planar magnetic drivers – comes into play. In a recent demo with the Audeze Mobius, Sankar explained that the reason the headphones are able to more accurately create believable audio is due to its proprietary software that takes into account the shape and psychoacoustics of the human head. The software is Audeze’s own creation, and can be calibrated by simply facing the screen and raising your hand. The calibration takes a second, and once completed you’ll be treated to some spectacularly realistic 3D effects. Of course, in a world of 7.1 virtual surround sound, object-based surround sound systems like DTS:X and virtual reality, it’s worth qualifying what kind of 3D it is. To that end, our experience with the Mobius isn’t the same as a traditional surround sound headset, where detailed sound effects are isolated to one headphone and one positional coordinate. Moving the headphone actively changes the location of the sound which can be handy when you’re playing a game like Overwatch or PUBG and want to know which direction a sound is coming from. We got the chance to test it out for ourselves using Blizzard’s team-based shooter and while sound effects weren’t as crystal clear as we’ve ever heard them, the results were fun, dynamic and, just as Sankar suggested, more engaging overall. The 3D imaging software was impressive, certainly, but gaming takes up only around half our time on PC. The other half is spent listening to music. For audiophiles, Audeze is outfitting the Mobius with planar magnetic drivers – a technology that trades the standard copper wire voice coil typically found in dynamic drivers for a very thin diaphragm with voice coils sandwiched between two magnets. Planar magnetic drivers are what the company uses in their high-end, award-winning headphones – some of which cost two to three times as much as the Mobius. While planar magnetic drivers help the audio sound more lifelike in its reproduction, it’s the combination of the planar magnetic tech and the 3D software that help the Mobius to create an experience closer to a live concert. In practice, the headphones did just that – placing the virtual stage in the center of your laptop or monitor’s screen, the sound would reflect our current position in respect to the screen. It’s not exactly like being at a live show, but the effect is more noticeable here than on any other traditional gaming headphone we’ve tried before. It’s also worth pointing out that the Mobius will cost about the same as a concert ticket: Audeze is launching an IndieGoGo campaign for the headphones on March 14 where you can snag a pair for just $199 (around £140, AU$250 ). Sankar says the headphones will make their way to the first set of backers around June, after which the regular retail price will become $399 (around £285, AU$500). While that might not make the Mobius the cheapest gaming headset on the planet, for gamers with audiophile ambitions, it might just be one of the best.